Conveyance is a crucial aspect that everyone is concerned about! Whether you want to go to office or a shopping mall, most often it’s a cab that people want to travel in. For the frequent cab travellers, make the most of the GetMeCab deals and discounts that are available in HappySale and get great discounts that helps you save big on every ride. Using these coupons you can book cabs for one way ride or round tours as well, depending on your requirement. You can select from some of the best car models such as Suzuki Swift, Tempo-Traveller, Toyota Innova and many more. The cabs that are provide are all clean and have all the facilities of a standard car so as to ensure that the customers have a good ride. In order to make the most of GetMeCab deals and discounts log in to HappySale today! Verified on 20/4/2019 .. GetMECab is offering upto Rs 2000 discount when you book both Taxi (GetMeCab) and hotel (OYO) for the same dates. This discount includes OYO booking discount and GetMeCab cashback when you book both together. Book now. Verified on 20/4/2019 .. Get Flat Rs 500 cashback on your taxi booking which shall be credited in your GetMeCab wallet. Cashback for a ride is only credited after completion of that trip, and can not be availed during the same ride. This Promotional Cashback for any trip is valid only for 45 days, from the time of completion of that trip. Cashback can be used for payment while booking taxis only on GetMeCab, and is deducted against the total payable amount/advance amount, while booking the cab. Cashback is only valid for online payment at GetMeCab, and can not be adjusted against the cash payable to the driver during your trip. The offer is valid on all taxi bookings through GetMeCab website and mobile app. Check more details in the landing page. Book today. GetMeCab is offering flat Rs 500 cashback on your booking which shall be credited in your GetMeCab wallet. The promotional cashback can be used by you, your friends and family for any future ride at GetMeCab. Book today. GetMeCab is offering flat Rs 200 discount on your every trip. Follow to the landing page where you can book cabs online for various destinations. Apply GetMeCab discount coupon on your checkout page to grab this discount offer. This GetMeCab discount voucher is applicable only on round way trips. Hurry up and book now! Book your cab rides online with GetMeCab and avail best discount deals on your booking. 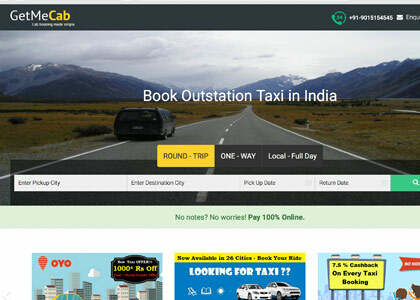 Here GetMeCab offers flat Rs 150 off on your online cab booking. Apply GetMeCab promo code on your checkout page to make avail of this best deal. This coupon code is valid only on one way trips. No other GetMeCab discount coupons can be clubbed with this offer. Book and avail now! Book and get flat Rs 200 off on your cab rides online at GetMeCab. This offer is applicable on your every trip. Follow to the landing page where you can book cabs online for various destinations. Apply GetMeCab coupon on your checkout page to grab this discount offer. This GetMeCab discount voucher is applicable only on round way trips. Hurry up and book your cab ride now. GetMeCab is offering best fare for Delhi to Agra route. Book for one way trip at just Rs 5298. Check the landing page for more details, terms and book your taxi today. GetMeCab is offering best price on local taxi bookings as well. Book here in Bangalore at just Rs 1500 for one full day within the city. Check the landing page for details and get more savings on your online cab bookings. Book today. GetMeCab is offering best fare for Mumbai to Pune route. Book for one way at just Rs 2240 for Sedon, Rs 3024 for SUV. Check the landing page for more details and book your today. GetMeCab is offering best fare for Mumbai to Shiridi route. Book for one way at just Rs 4860. Check the landing page for more details and book your today. GetMeCab is offering best fare for Shirdi to Aurangabad route. Book for 2 way trip starting at just Rs 2500 for Sedon, Rs 3024 for SUV. Check the landing page for more details and book your today. Verified on 20/4/2019 .. GetMeCab is offering the best fares on cab bookings for Bangalore to Tirupati route. For this route you can choose from cabs like SUV, Hatch back, Sedan etc. Book using HappySale offers and get best savings on your car rentals. Whether it’s travelling to office from or from home to a shopping mall or the airlines office to book your travel tickets and other life nuances – everyday commute is a vital aspect. For individuals who depend on taxis and cabs on a daily basis, its quiet a struggle to stand at the taxi stand and wait for a cab. There are times when you are too pressed for time and waiting for an indefinite time for a cab is something that would delay your entire routine. To ease out such situations and travel smoothly, you have the getmecab brand that allows you to book your taxi online and make the commute easy. Customers who want to save money whilst booking cabs online can make the most of the getmecab coupons that are widely available at HappySale for you to browse and select. When you opt in for the best of the getmecab promo codes you save in many ways on your daily conveyance. The offers and discount deals on HappySale come in many types that helps you to travel for less. For instance, there are deals where the online customer can save on his/her one way travel to airport, shopping mall or office. You can also make the most of the cash back discounts of Rs.500 off on cabs or more, that are provided from time to time. In addition to these offers there are also combo offers on taxi booking as well as hotel room booking. This kind of offer is perfect for people who are constantly travelling and are on the lookout of excellent deals on commute and accommodation simultaneously. Furthermore, there are discount offers where you can save as much as Rs.200 on all your tours. All you need to do to bag the authentic and latest getmecab coupon codes is simply browsing through HappySale and selecting from the discount deals that are on offer. Each of the deals offers you all the necessary details so that you can know better about the same prior to activating the deal.